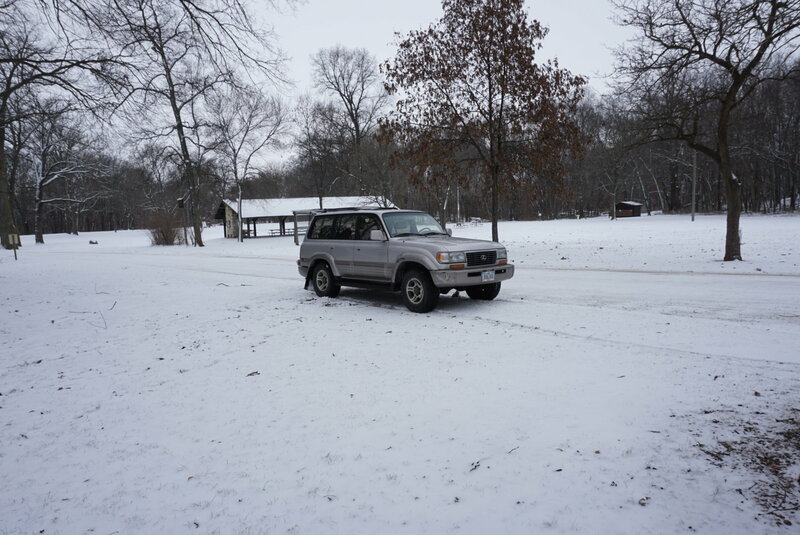 George has a very much stock LX450 with 31" tires, auto, and 410 gears. This picture was taken shortly before the rear 9.5" diff decided to explode. It was recently rebuilt (3000 miles ago) by a local differential shop. Ever since the rebuild, there was always a slight whistle on both accel and decel. and this is what I received by Fedex ground. Chunks of teeth missing...terribly scarred center carrier. This Yukon ring is history now. Everything was affected....chinger marks everywhere and chunks of metal scooped out. I can see the lower piece of crush sleeve....but where is the large inner pinion bearing? Here's what's left of the large inner pinion bearing. Even the inner bearing cone in the background cracked into numerous pieces. It's very unusual for the inner bearing cone to break into pieces. The smaller outer bearing suffered some damage. Cage was scrubbed pretty good.... probably by the crush sleeve. Crush sleeve has some serious cosmetic damage. Looks like the bearing was spinning on the pinion shaft. Some of the large massive ends of the pinion teeth were knocked off also. This end faired much better. The pinion races were removed for inspection. The pinion shims were placed behind the large pinion race. The massive inner pinion bearing likely exploded first and all the other diff damage is secondary. which could self destruct at some future moment. The center carrier is severely scruffed up. Best to replace it also. Only the 12 ring gear bolts/nuts are salvageable. A good set of 410 take-offs and center case were found. 81 ft/lb with loctite. George's rebuild will see new bearings, crush, nut, triple drilled flange and a Marlin "eco" seal. Another look at the races....small outer on the left. No surprise that the inner race is beat up. The smaller outer PB did better. Another angle on the outer. The rollers are not that bad....no chunks missing out of them. and this one one is ok so far. Not to ever be re-used but it is a functional bearing still. Now onto the install itself.....a 049" pinion shim will be tried first. The bearing will be properly pushed on with an extended spacer. Harborfreight 12 ton easily does the job. Inner race is tapped in with an old race that offers 360 degree support. Same thing on the smaller outer race.....old race with 360 degree support prevents damage to the new race. Both races are fully seated in 100%. Mount the pinion assembly in the diff and tighten the nut just enough to offer 10 or 20 inch/pounds of bearing drag. The center carrier was then mounted, backlash set with some bearing preload and yellow paint applied. Pattern is too deep and favors the toe end too much. Even the comet tail on the pinion paint shows very shallow.....shallow on the pinion means too deep in the ring gear. Comet tail should be in the center of the tooth here or biased a bit towards the root. Skipped a few pics and replaced the 049" with a big jump to .039".....drive looks much better and might be just a bit deeper than I like to see. Pinion comet tail is hard to read but looks to be favoring the outside more than it should. Let's try .036" which is 3 thou thinner. This can get repititious but it has to be done to get the quietest and strongest setup. Bad angle for the flash but this is a NICE load bearing pattern. This tooth shows it better. Pinion depth is very good....now to assemble the rest of the pinion end. Remove pinion one last time and insert crush sleeve. 360 degree support and BANG it down. Double check that the wire did not get knocked off. Never had one come off a Marlin seal yet. Anti-seize and install the new flange. And a dab of anti-seize on the underside of the flange nut also. Takes less than 200 ft/lb to now crush the sleeve. A good solid 10 in/lb for the start torque value. DING! and this end is complete. Center carrier is now installed and 70 ft/lb on all 4 bearing cap bolts. Combined preload is at 18 in/lb. 10 in/lb for the pinion bearings and 8 inch/pounds for the carrier bearings. Backlash is checked on every other tooth for about 20 readings and .006" was the minimum backlash noted. The 2 tabs saw blue Loctite and a healthy 10 in/lb. A very steady hand and a diamond coated bit make ring gear engravings easy. The outer pinion bearing will also be sent back to George. This one was burrito wrapped. Ready to go back to George.